According to Peter K's reviews these are all great skis.? The only signifcant difference are the turning radius.? I really like my current Dynastar's and am leaning that way.? ? I ski the west, with about 50% offpiste.? I will occasionally run moguls but not often. I welcome any opinion as to which ski might suit me best. That is a roster of rather excellent skis. Not first hand experience, but I've heard that the Watea 78 is aimed at lighter skiers so you might check and see if you can validate that. I have the iM78 as well as a Watea 84 and I find that I have wound up enjoying (and using) the Watea 84 more than the iM78 because I like the lighter and livelier feeling of the Watea. I'm 5'11" and 190. The Dynastar has been a perennial favorite for a long time. Also, the Dynastar Contact 4x4 was a new ski last year (I think) that was reviewed really well (but with a 75mm waist vs. the 78-80 of the others). I think the iM78 will feel more damp than the Dynastar 8000, so if you like the feel of the Intuitives then the 8000 may be the better choice. Don't believe there is a bad decision in the whole group. Did you see Peter's comment on the Dynastar Contact 4x4 that said the the Dynastar Sultan 85 may be one of the few new skis that is actually worth waiting for. Most of the other really good skis are unchanged from last year. I am biased but I have skied all the skis you have listed. Right away I would rule out the Watea 78. In my opinion it is not a great ski and the IM 78 pretty much dusts it in every category (the Watea may feel a little lighter). The 8000 is an excellent ski, but in my opinion it is less dynamic than the IM 78. It is a very solid off piste ski, but it won't bend and carve the way the IM 78 will. Skied with strong input where the ski gets continually bent in turns, I don't think there is a ski as good as the IM 78 (in the mid fat category) I also like the tighter turning radius. Off piste it is incredibly solid in crud and chop and the tighter turn radius really shines in bumps and in any terrain where short radius turns are necessary. I have also skied it in 2 foot of fresh snow it was excellent. The railflex binding is a big advantage as you can move the binding back 1.5 cm which is a better position in fresh snow. I love the feel of Head skis and for the life of me I don't understand the most common knock on Heads that they are overly damp and lack snap and life. If you bend this ski it will give you rebound like no ski on your list. of whats listed, the Head 78 but I will add that if you are skiing 50% of the time off piste in western soft snow, but only occasionally run bumps, I am a little confused about where you're skiing. Tree's? what kind of off-piste conditions?? I would defintiely be looking for a true mid-fat, like the Sultan or a Icelantic Pilgrim, Line Prophet 90, Blizzard 8.7 and a few others in the 85-92mm underfoot category. All of the above have under 20 m tr. All are plenty quick and nimbe, there's really no dis-advantage over a 78-80mm ski unless you are only skiing manicured groomed.? My everyday ski is the Pilgrim, 90 underfoot which has a 19 m tr and it will perform better than the 78 in softer snow conditions overall and give nearly nothing up on the groomed. Clarification.? Of what was listed, I would pick the iM78 over the Dynastar 8000 for me.? But I was also factoring in your comment that you really like your current Dynastars for you.? My recommendation for you wasn't at all negative about the iM78's. Jim, I noticed Peter's comment on the Sultan 85 and I noticed Ron's commennts on the Pilgrim giving nothinmg up on the groomed vs the IM 78. I have not been on the pilgrim or on the Sultan 85, but I know enough about skis and physics to know that when you make a ski wider you have two choices, make it stiff or make it softer. The only wide skis that I have been on (85mm waist to 95mm wiast) that actually railed like race skis on groomed terrain are stocklis. They absolutley rocked and the 95mm stockli that I skied felt like an even better carver than the IM78. It actually was much tougher to bend but on edge it railed at speed like a GS ski, with incredible stability. Enough that I was thinking I should buy this ski. Now here is the problem, for me, at my ability, it was a one trick pony. It was a 95mm GS ski. When I took it into off piste terrain it was almost unskiable. If I got back slightly on the tails it would buck me like riding a bull (not that I have ever riden a bull but I imagine this ski was close!!). Clearly the trend is for everything to be wider and many people ride 90-100mm skis as their everyday knock around skis and that's fine. But the idea that these skis will do the same as carvers (65-75mm skis) or midfats (in the 76-82mm range) is just falacious marketinng. This is not to say that they aren't making some great truly verstaile skis, but I have yet to see a 90mm ski that can do what the IM 78 can do with regard to the groomed and versatility. Of course it all depends on what one wants most in their do all ski. I haven't skied any "wider" skis so don't have any first hand opinion.? However, I noticed last year when I changed from the iM78's @ 124-78-110 (15m) to the Watea 84's @ 126-84-112 (19m) that I could really notice the difference at the end of the day.? I hadn't noticed any extra pressure or effort skiing the iM78's versus my "narrow" SuperShape Magnums @ 121-71-107 (13.5m), but at the end of the day my ankles could feel the extra pressure required by the only slightly wider 84's, especially one day when the snow surface was a melted and refrozen crust and the skis were "on-edge" rather than able to bite into the snow a bit. I agree that the physics of the "edge being farther from the ball of the foot" with wider skis requires more leverage, but I also think other factors can lessen some of the effects.? For example, more side cut means ski can bend/turn with lesser angles, softer ski can bend with less effort, softer western conditions (even on groomed) gets the ski more into the snow and means the ski is less on edge and the lever point moves closer to the foot. I did find it interesting that the early laminate Monsters (the iM88 and iM82) were pretty stiff skis, but then they found a different mix with the iM78? And skiing style is also in the mix; preferences for skiing down in the snow vs. more floating on top. And so, although I don't have the knowledge to really compare, I have become very happy with the skis I currently have, irrespective of the marketing efforts of wider skis. As I added the IM78 to my quiver after skiing ended last year, I'm very glad to hear all the positive comments about them. With respect to wider skis, i.e. 88's & above, I believe that you have to be true to yourself in ski selection. 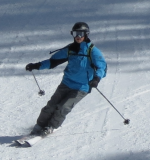 I'm a east coast skier and a "turner" rather than a higher speed GS skier like Philpug. My other skis are Supershapes, so, the IM78 will come to Jackson Hole in January. I'll accept that they may not be the perfect ski if we get a lot of snow, but, I really value knowing how a ski will perform in all conditions. I'll take the devil I know rather than the unknown into tough conditions found in JH. Ron is a good example of staying true to what he wants to accomplish on skis. He's left the more traditional widths to support what he wants to accomplish in off piste western skiing. Perhaps my main point is that once you pick a ski, it's really about learning how to make it work for you. I've found my first impressions of skis modified as I've my time on them increased. Sometimes good, sometimes bad, but, you just have to experience it to find out. Last year, I changed my golf irons. I tried out the new clubs several times and was impressed enough to make the switch, but, it still took me months to own and trust them automatically. And damn it feels good to be talking about skis and skiing rather than golf and biking. But not as good and Ron (and now Gary) who are already skiing. Welllll, it HAS been a while, but it looks a LOT like SNOW to me??? Did I win the prize?? I agree with Ron.? Torsional stiffness is the key to how well a fat ski will carve and perform; when you get back on the groomed.? It took many manufacturers a while to figure this out as seen during the nineties.? You can not make a shaped ski perform if it doesn't have sufficient torsional stiffness. I am leaning toward the Dynastar's but I could end up with Head 78's. The new Nordica 78 waisted Hot Rod "flat", it is a Monster 78 with a personality. Forget what you know of Nordica system skis, the flat 78 and 84's are muuch nicer than the Head Monsters and beefier than the Watea. I haven't skied the 8K, but knowing how Dynastars ski, better then them too. These skis will get very little press, but are some of the best flat ski values out there.